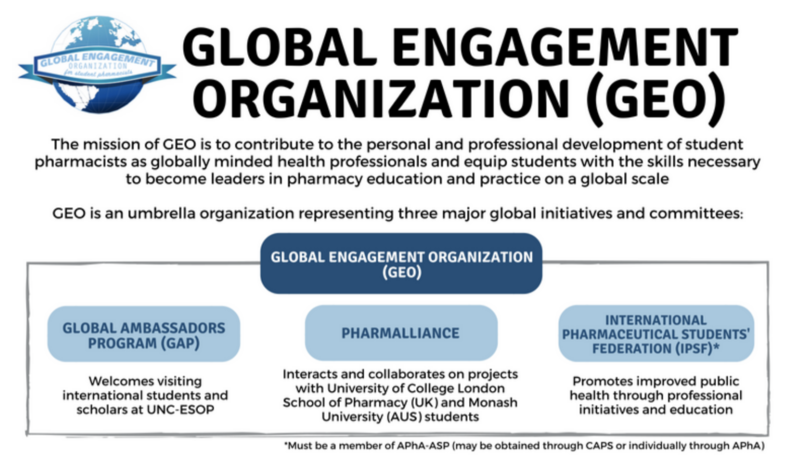 Global Engagement Organization (GEO) is the newest student organization at Eshelman School of Pharmacy. GEO was created by students who are passionate about personal and professional development of students as globally minded health professionals to equip them with the skills necessary to become leaders in pharmacy education of practice. PharmAlliance: PharmAlliance encourages, educates, and promotes cultural awareness of pharmacy collaborates on a global scale between University of North Carolina Eshelman School of Pharmacy, University College London School of Pharmacy, and Monash University. PharmAlliance leaders and members engage with students in London and Melbourne on collaborative projects. 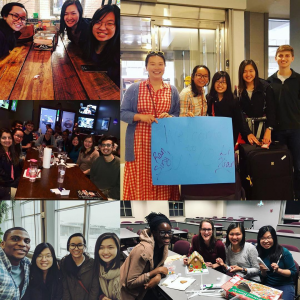 Global Ambassador Program: GAP welcomes visiting international students and scholars from across the globe, while educating and promoting cultural awareness of pharmacy within UNC ESOP. International Pharmaceutical Students Federation: IPSF strives to be the leading international advocacy organization for pharmacy students, promoting improved public health through provision of information, education, networking and a range of publications and professional initiatives. GEO’s first year as an officially recognized student organization at ESOP is led by Ember Lu (President, Class of 2020). Sit with Senate’s Clara Kim met with Ember to learn more about GEO and the importance of global and international initiatives in pharmacy. Sit with Senate: What motivated you to serve as President of GEO? Ember Lu: There are three main reasons I wanted to serve as the President of Global Engagement Organization (GEO). First, I saw that there was genuine interest in global engagements from the students around me. Starting in my PY1 year, I noticed my fellow classmates inquiring about the Global Pharmacy Scholars program. When they learn that the actual rotation is not until their PY4 year, they become disheartened and disappointed. Through GEO, students can get involved with global initiatives and projects early and better prepare themselves for future global endeavors, whether that be studies abroad or internships. Second, I wanted to give back to the school for all the resources and opportunities already provided. There was not a hospitality program put in place to thank international students for coming and sharing their experiences from their home countries before the Global Ambassador Program (GAP) was established. Third, I have a personal investment in GEO. Having been part of the team that built up GEO when it was just the three branches, PharmAlliance, International Pharmaceutical Students’ Federation (IPSF), and GAP, I want this organization to thrive and succeed. I’ve seen what we can do individually, and am looking forward to seeing what GEO as a whole will be able to accomplish. SwS: What are some events/projects that you are planning on holding this semester? EL: The biggest GEO event we have upcoming this school year is Ready, Set, Go Global. The event will run in late October to early November for a duration of three days, with each day having a different theme. On Day 1, Get Ready, students will learn about international opportunities that are available at UNC ESOP. On Day 2, Get Set, students that have had previous international experiences will share their experiences and learnings. On Day 3, Go Global, a professional that works in global health will be invited to UNC to present on real-world implications of practicing globally. This is the first time GEO has organized an event to this scale and we are always happy to have more student involvement dedicated to organizing Ready, Set, Go Global. If you are interested, please feel free to reach out to me. SwS: Why is having a global mindset important to pharmacy students? EL: Having a global mindset is absolutely essential to pharmacy students as the world becomes a tighter knit space and we become immersed in all cultures. I would even argue that you need a global mindset to be seen as a leader. Being able to consider a problem from all viewpoints is one aspect of what makes a leader respectable and trusted. At the UNC Eshelman School of Pharmacy, aren’t we in the best position to become the future leaders of pharmacy? For more information, please visit the GEO Facebook page: https://www.facebook.com/GEOatUNC/. Primary contact: Ember Lu, yiwei_lu@unc.edu.